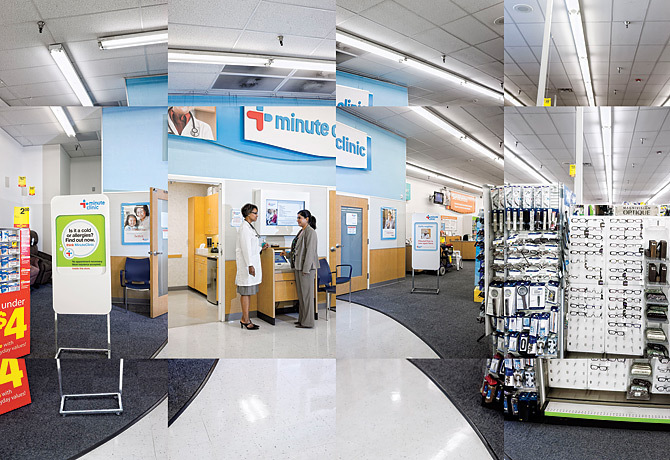 This MinuteClinic in Downey, California, is one of about 500 that CVS operates around the country. If there's one thing most patients lack, it's patience. And who can blame them? When you're burning up with fever or your child has an earache or that sore throat you've been nursing doesn't seem to be going away, the last thing you want to hear is that your doctor's next open appointment is a month from now. Good thing then that there's a supermarket or pharmacy nearby. Need to buy some shampoo or pick up a few things for dinner? Why not see the doctor  or, more accurately, the nurse practitioner or physician's assistant  while you're at it? For all the complexities of the U.S. health-care crisis, most Americans experience the problem in a straightforward way: it's just too hard to schedule face time with your family doctor, and it costs too much when you finally get in the door. Of the approximately 1 million physicians working in the U.S., just 30% provide primary care. If you do get an appointment during the week, you'll probably have to take off time from work and carve out at least a few hours to sit in a waiting room. And if you get sick on a weekend, good luck. That, of course, is assuming that you have a doctor in the first place, not a given in a country where up to 50 million people lack health insurance. Even for the insured, ever changing corporate health plans may mean that a physician you see one year is not available to you the next. In times of illness, more and more people just show up in emergency rooms, which increases crowding and slashes revenues as bills to the uninsured go unpaid. In the past 13 years, at least 190 ERs have responded by shutting their doors. Enter the retail health clinic. In the past decade, more and more pharmacies like CVS and Walgreens, supermarkets such as Kroger and Publix and big-box stores like Wal-Mart have made space for clinics that treat minor ailments, administer vaccines and examine kids who need medical forms to enroll in camp. In those nine years, storefront clinics have logged at least 3.4 million visits. Today there are about 1,200 such clinics, pulling in some $550 million in annual revenue, by one estimate. Doctors, worried that the clinics will dig into their bottom line, are resisting the trend, but it's hard to argue that the innovation wasn't needed. The cornerstone of prevention is early detection. Minor problems caught right away  from infections to mild hypertension to a suspicious lesion  may never blossom into major problems. But the inaccessibility of doctors makes early detection more difficult. Among the new ranks of providers filling the void is the Little Clinic, a company that operates 99 in-store clinics in nine states. The Little Clinic experience is an unabashedly retail one. You can get in and out in 15 minutes during hours that extend into evenings and weekends. Prices are clearly displayed, as is the menu of ills the clinic can address, such as strep throat, sinus infections and flu. There are also preventive services like cholesterol and hypertension screening. And the cost? For basic acute ailments, an uninsured person will spend about $60 (without tests) at a retail clinic, compared with $60 to $110 at a doctor's office or hundreds more in an ER. And while the retail-clinic model launched on a cash-only basis, most outlets now accept insurance, used by about two-thirds of patients, according to a study by the Rand Corp. published in 2008. There are some practical benefits to combining the place where you see your health-care provider with the place where you shop. "I can walk [patients] out of the clinic and show them a nutrition label," says Sabrina Freeman, a nurse practitioner and manager at the Little Clinic. Everyone agrees physicians should stress prevention, but during an appointment, "you probably spent five minutes with somebody talking about those things."